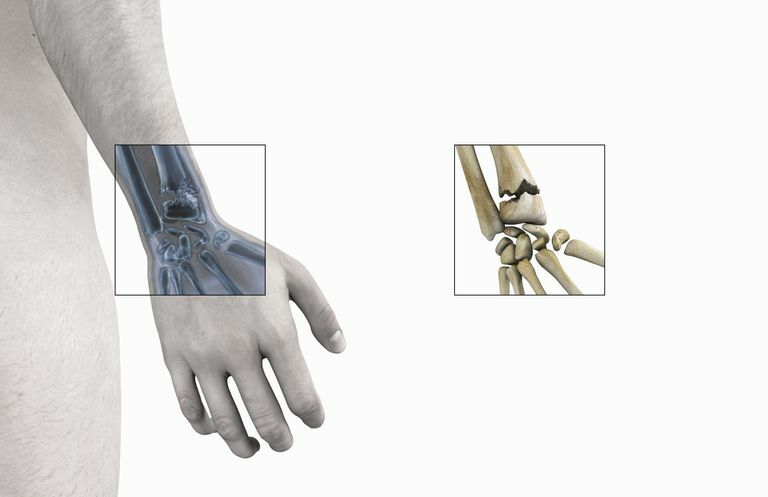 The Smith's fracture is a specific type of injury to the forearm bone (the radius) near the wrist joint. In this injury, there is displacement of the bone such that the wrist joint rests in front of its normal anatomic position. The injury is most commonly found after falling on to the back of the hand, or by falling with the hand planted on the ground with your body twisting around the hand. A Smith's fracture is also sometimes referred to as a reverse Colles' fracture. The Colles' fracture is also a type of distal radius fracture, but the bone is pushed back rather than pushed forward. The wrist joint is the junction of the forearm with the hand. The joint is formed by the two forearm bones (the radius and the ulna) joining together with the small bones of the wrist. Generally, when someone is describing a wrist fracture, they are talking about an injury to the end of the radius bone. However, the word wrist fracture can be used to describe other fractures such as scaphoid fractures, distal ulna fractures, and other bone injuries around the wrist joint. Because Smith's fracture is quite unstable, this injury almost always needs surgical stabilization by some method. If the fracture is displaced from its normal position, it will generally need to be secured in position with metal implants, typically a plate and screws. Other options to stabilize the fracture include pins inserted through the skin and external fixation. Most patients prefer the plate and screws since the fracture is well secured, and they can begin early efforts to improve the mobility of the joint. While casting may be attempted, but needs to be watched carefully to ensure the fracture stays in proper position as there is a tendency for these fractures to slide back into a displaced position. Lichtman DM, et al. "AAOS Clinical Practice Guideline Summary Treatment of Distal Radius Fractures" J Am Acad Orthop Surg March 2010 ; 18:180-189.